He has some spare capacity so offered it to us and we ended up having a great industry screening of both Gone Fishing and EXAM. Excellent. First, I started writing this letter to you after completing an HOUR long radio interview with members of the cast talking about the film we made and the 20 odd print / media stories it’s already received in papers from all around London and the Midlands. So for a short film it’s gotten some nice early exposure. One of the biggest bonuses has been the involvement of the Princess Diana Anti-Bullying Award which 6 of our cast members received. They won this because they were willing to take the whole anti-bullying theme (and the film) to other schools to raise awareness about the topic. And now, with private funding behind us we get to tour the film around England schools. Yet… still only a small select group of people have seen the film and I can’t help but to wonder… Is it any good? In your “Gone Fishing” seminar you said “You will never watch your film for the first time” and for me, truer words have never resonated more clearly. Not a scene goes by without my critical mind counting every problem with it. However, I’m sure I’m not alone in this film making problem. So a few lessons and surprises I’ve learned which relate to things you teach about in the “Gone Fishing Seminar” (hereafter GFS) you might be interested in. “Just because you’ve premiered doesn’t mean the work is over.” I am shocked how many film makers I have found think that it’s just make a film, premiere it, post it on line and then forget about it. In the GFS half of your time spent talking about the post production work. Yet lots of film makers seem amazed that “I’m still at it.” Is this uncommon do you think? Wouldn’t your future success depend a great deal on how strongly you market after your film is completed? “Begin with the end in mind.” The biggest thing I think I took away from GFS was to know what you want to do with your film - your goal, “To make an Oscar Winning Film or at least an Oscar Qualifying Film.” This was clear and concise. Our goal was “To make an educational film about bullying” but that wasn’t enough because midway though, we started to say, “A dramatic film about bullying to be shown in UK schools nationwide” – I think we should have started with that as it would have made a big difference on early decisions we made. Those are just a few, the ones that seem to mean the most to me right now as I start to recount the making of the film and I thought you might be interested. Thanks David. Yes I agree with all the points. One thing really does stick with me, which is ‘make a declaration and write it down, the laser focus on that declaration…’ And before you make a declaration, develop it, hone it, be clear and specific. As you said “A dramatic film about bullying…’ is a much better way to put it and would inform your choices on the journey and keep your mind focused when everyone about you is losing theirs. In a week of loose ends, the kind you get when a production wraps – stuff that’s gone missing needs finding, stuff that you put off as the production dominated your life needs doing, invoices appearing and sifting accounts until it all ties up and of course, a little sleeping, I find myself writing a matching blog – a kind of hotch potch of stuff that has happened over the last week. Dearest Chris! I am SO honored to be sending you this e-mail. Your uber-award-winning film has JUST received yet another award – I hope you’re not bored with all these wins! 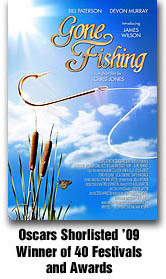 GONE FISHING was chosen as this year’s recipient of the GRAND JURY Award for Best Short Film. I wish we had buckets of cash to send you. But all we have is adoration. Thank-you SO much for sharing your film with Edmonton! I know they’ll love it as much as we do! Finally, we just got word that we are in the Asiana International Short Film Festival (AISFF) in Seoul, South Korea next month. I am hoping that I can make it out there as they have a sponsor for flights and accommodation. 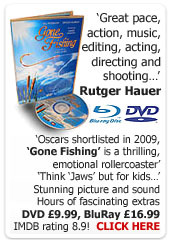 The festival campaign for Gone Fishing is now winding down as I have decided not to enter any more festivals, it’s just too time consuming and costly. What a run we have had though, and fingers are still crossed as we continue to compete in a number of fests in the near future. Yesterday I was invited by Kodak to speak to their top motion picture European executives, about what it’s like to be an independent producer in 2009 – reading between the lines, it was really about how Kodak could better reach emerging film makers in the digital age, and tell them about film and why it’s still a great choice of ‘shooting format’. It was quite a privilege to be asked, and wanting to do the best I could, I put together a PowerPoint presentation to arrange my thoughts in advance. Hosted at the HQ of Cinesite in central London, the presentation evolved into a robust conversation about film, digital and Kodak, and I think everyone got something out of it. Many of the ideas we discussed should, in fairness to Kodak, stay behind those closed board room doors. But I did make a list of ephemeral differences and distinctions between film and video (digital) and I thought I would share some of those thoughts. If you can shoot film, generally, you will get a better level of crew, which often begins with the DP – why? Crews love to shoot film. There is a different vibe on set, it’s more exciting, and that also filters through to the actors. When shooting film, everyone knows that each take costs LOTS of money, and so energy levels raise and people nail it in take one, two or three. Typically on digital shoots, energy levels are lower and takes go on and on. A better crew usually means better film. Film sets tend to be more disciplined than digital sets. Shooting film will create less material to edit in post – as editor Eddie Hamilton put it – ‘digital shoots can create more material that is poorer in quality’. This extra material can have a significant impact on your post schedules. Drop a roll of 35mm and it’s a loud clang. Drop a hard drive and you could destroy a days worth of work. Digital data is more fragile. Many digital productions, at one point or another, loose some material due to operator error. There was also some discussion around 2 perf 35mm (image right shows open gate 35mm and 2 perf footage below) – a format that shoots twice as much on the same amount of film stock, thereby literally halving the lab and film stock costs on a production (2 perf was famously used to shoot the spaghetti westerns with Clint Eastwood and is ideal for films shoot in the 2.35:1 aspect ratio like we did with 'Gone Fishing'). There are more and more 2 perf cameras appearing and this is a good thing. We had hoped top shoot Gone Fishing on 2 perf but we could not get the cameras back then. I would love to hear from anyone who has shot 2 perf! Eddie Hamilton turned up as I was wrapping up, and added his own take to conversation. All in a great event and I enjoyed every minute of it. Last day of the shoot... and first day of prep for the next! After some feedback I received last night, I have also decided I am going to make a short introduction film for my ‘Gone Fishing’ online workshop – at the end of the workshop we ask delegates for feedback, and also for comments about how we could improve the workshop. Consistently people have said (to paraphrase), ‘I was unsure about signing up, and if you had a short video that covered the content, I would have signed up right away... I am delighted I did sign up, hence I have given the workshop a five star review.’ So that video shoot is now on my agenda for the next few weeks. Can you provide us with a one line comment or summary - this will appear at the top of your review. Truly Exceptional... Don't Skip This!!! Tue, Sep 8, 2009 10:24 PM An outstanding seminar filled with significantly useful and immediately relevant information for all types of film makers. I only wish I had taken this seminar before setting out on my first film, but will now use it for all of my film making until the day when I stand in the Kodak Theatre in LA and thanks the Academy and Chris Jones!!! This course is everything I hoped it would be. Useful and filled with tons of interesting bits of information. To me, this course is designed for the film maker who is not afraid to get their hands dirty. Meaning, that this is not a "step-by-step how to" course, this is a course which offers real life experiences and challenges the viewer to go out and make their own choices, mistakes and successes. Chris shares a his personal film making lessons in a thoughtful and reflective way which is engaging and draws you into the experiences. You share his success and pain and thus take the lessons learned as part of your own experience. I would highly recommend this course to film makers of any experience level, there is so much great information one can take away from this course! There is more 5 star feedback over 40 delegates here. Looking for the John Truby Podcast?